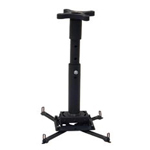 Projector ceiling mount kit includes a universal projector mount, 18"-24" extension column and ceiling plate to secure a projector from a fixed ceiling structure. Saves time and covers a wide variety of installations within a single package. Can you tell me what the bolt pattern size is at the top piece that I will need to bolt to a steel plate? The bolt pattern at the bottom is 6"x6" and 6" by 6".